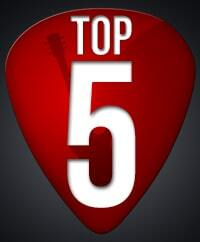 Hi everyone, welcome to this month's roundup of the most watched guitar lessons at TheGuitarLesson.com. Every month, I go through my site analytics, to find what my students have been up to, what type of songs they've been learning. August is traditionally a slow month, since it's one of the hottest months of the year, and lots of people go on vacation, neglecting the guitar. If that's you, it's time to feel guilty, and pick up your guitar more often in September! We have a brand new entrant to our top 5 club, one that has never been here before. Summer of 69 is a terrific song, it really brings that nostalgic summer fun feeling with it. I'm thinking that the summer month of August what the reason this song made it to the top 5, since it's never been here before. We shall see what happens with it in September. Wow, another new song to make it into the top 5 list. The surprises just keep on coming in August! Hotel California is, of course, on of the most popular songs in the world. The intro solo can be recognized a mile away, so if you don't know it yet, you should definitely have a look at it. This song was freshly released in August, but it didn't really get all the hype new songs usually get. I really like this song, it has a great groove, and it'll really-really advance your fingerstyle technique. It is not really for beginners though, maybe that's why it didn't get that much traction. The most watched lesson on TheGuitarLesson.com in the month of August was Somewhere Over the Rainbow, by IZ. He actually plays this song on a ukulele, but if you place a capo on your guitar, and strum it the way I teach you in the lesson, you'll get a very authentic cover version. And if you can, sing along!